It’s time for another blogging tips post. This is where I pretend to be some experienced blogger and pass on some wisdom. The truth is, I’ve only been blogging for about a year now. With over a decade of website marketing under my belt, I do have some knowledge to share. Besides marketing knowledge, I feel that I’ve learned a lot during my first year of blogging. I may still have a lot to learn, but you might as well learn from other people’s successes and failures. While recently in Mexico on vacation I couldn’t help but notice a huge difference with how merchants operated compared to here in Vancouver. In the majority of stores in Canada and the US, merchants sit inside their stores waiting for customers to come to them. The merchants in Mexico provided a sharp contrast, at least where I was visiting anyway. Most of the merchants there were out on the sidewalk talking to tourists walking by, trying to draw them into their stores. They tried different approaches, ranging from friendly to creepy to outright aggressive. The key was that they were forcing you to notice them and their store. You couldn’t just walk by and completely ignore them. Even if you’re replying ‘no, gracias’, they’re making an impression on you. Most likely you’re turning your head to look at them while replying. Then there right behind them you get a quick glimpse of what they’re selling. If their approach is convincing enough, they might draw you into their store rather than casually window shopping as you pass by. It makes you wonder why merchants in Canada and the US rarely employ similar strategies. Instead they just rely on their storefront displays to draw people in if they are genuinely interested. They don’t seem to care about making an effort with the people who need any kind of convincing. It seems it’s only the kiosks in the middle of the malls that use this strategy here. Being the blogger that I am, I got thinking about how this same kind of situation exists with bloggers. A lot of novice bloggers just sit inside their ‘stores’ waiting for ‘customers’ to wander in. Worse yet, when they start their blogs their ‘store’ is on the outskirts of town with very little traffic passing by. Just like in Field of Dreams, they’re living by the “If You Build It, They Will Come” mentality. How long are you going to sit back waiting for traffic? With blogging it isn’t simply a matter of writing quality content and sitting back waiting. That’s fine and dandy if you are just writing a personal blog to share experiences with your family and friends. If you are trying to build up a successful blog and potentially make money, there’s a little thing called marketing. For one reason or another a lot of new bloggers are a little hesitant to fully pursue marketing. They might simply be too shy. They might not realize the importance of it. Or sometimes they are just too stubborn to change their strategy. Like the merchants I came across in Mexico, bloggers need to actively get themselves in front of potential visitors. The more people you can get your name or URL in front of, the better your chances of scoring a subscriber. The easiest way to go about this is to comment on a lot of blogs regularly. That way you’ll get noticed by other bloggers and people who read blogs. The approach you take with those comments will affect what kind of results you get from it. Leave brief, low quality comments and few people will be interested in checking out your site. Leave interesting or insightful comments and a lot more people will notice. The next way is to get mentioned by others on social media. This is where it is extremely helpful to have a strong network of contacts. If you’re close enough with bloggers, they might share your posts on their own or they might agree to a direct request. If you sit back and wait for mentions on social media, you might have to wait a lot longer. So don’t be afraid to be more proactive about it. Even better, try to get linked to from other blogs. Then when you’re attracting direct visitors you’re also helping your search engine rankings. Mentions within a post’s content can deliver substantially more traffic too. On some blogs you might benefit even more by getting on their blogroll since that is on their sidebar or always 1 click from their homepage. Take a chance and make the request via e-mail, but be aware that you’ll have better results when you ask existing contacts and when your blog is more developed. That is scratching the surface of ways you can get more exposure for your blog. Beyond that look into blog round ups, directories, blogger lists, etc. As you build up more exposure, search engines will take notice and all of those mentions will contribute to your search engine rankings. Before you know it, your efforts snowball to the point that traffic keeps coming in even when putting in minimal effort. If you want your blog to grow and someday make money, try thinking of your blog more as a business. Would you be taking the passive approach if it was a physical business? For all the bloggers out there, how aggressive do you feel you are with your marketing? Awesome post Jeremy! I never thought anyone could pull off relating blogging to someone hawking their stuff in Mexico, but you did it very well. I take marketing of my blog extremely seriously. Being in advertising myself, I know that you’re going to get (In general) much more traction if you go out and tell people about your product as opposed to burying an ad on the fourth page of a newspaper. Looking at your list, I think I am doing all of them and actively look for other areas as well. It is nice to see the results in traffic flowing in at times when you put very little to nothing in because of all the ground you’ve laid in marketing. I would think you are doing things on the list quite well. Your blog has been growing quite quickly. I can definitely relate to your comment about traffic still flowing in at times when effort is reduced. I’ve done considerably less work on my marketing in recent months but I’m still getting a fair amount of traffic due to the early work. I now feel under pressure to leave an extremely insightful comment :-)! I agree with you, there are so many personal finance blogs on the web that unless you’re willing to put yourself out there, you’ll more than likely disappear into the background. I’ve also found that if you’re willing to help others, they’ll often return the favour. Another great blog tips post Jeremy! I totally agree about the benefits of helping others. I think that is a major factor in why my blog grew at the rate it did. I’ve always been quite willing to help people even if there wasn’t much to gain from it at the time. That karma usually comes back to you and those people find a way to repay the favor. Excellent post! I’ve been one to go through periods of aggressive growth-related activities as well as more passive times. Those have usually been a product of time constraints due to my jobs but I now have a renewed focus to dedicate consistent time and effort to growing my blog into what it could/should be. It’s an exciting adventure to say the least! Those passive times are often unavoidable due to other commitments, but if you put in enough time and effort beforehand, you’ll notice less drop during those times. Best of luck growing your blog Jen. Great tips, Jeremy. This is a good reminder that we should just sit back and wait for visitors to come to us. We need to reach out to others and cultivate relationships with other bloggers. I think you’re a good model for us all! Thanks Ryan. Yes, cultivating relationships with other bloggers is quite important, as is building those relationships with actual readers. It’s fellow bloggers that can help expand your reach a lot though. You are completely right. While growth can come by being passive it will be very small. You need to really get out there and network with other bloggers to make connections. I think most people would get too frustrated by the slow growth of being passive. It’s probably a big reason why many bloggers give up in the first year. They don’t approach their marketing effectively and then get tired of the lack of progress. That screams blogger to me when you see something completely unrelated to a blog and can find a way to tie it in. I would also add that you have to market for a while before people start visiting. If you try for a week or even a month and have no traffic, just keep doing it. Eventually, if you are leaving quality comments and writing decent material, someone will read it. At least in my experience so far. Good point Kim. Just because you’re doing marketing, it doesn’t mean that you will get instant traffic. You just have to have faith in your efforts and keep plugging away. Over time, more people will start noticing you and more bloggers will try to help you out. I did the mistake to stay in my corner at the beginning and lost a lot of time. Networking is essential, although I still have a hard time taking the Mexican approach. I hate those pushy sellers and wouldn’t want to be considered pushy in blogging. I’d say I am pretty average now, but the pushier people are probably doing better. It is just not my type. I was the same as you, Pauline. We spent the first few months we were blogging just focused on how to write content and navigate the waters that I didn’t really market our stuff at all. Though we’re trying to market it a bit more now (more guest posts, etc), we’re still pretty passive in comparison to many others, which I think feels more genuine. Hawking chiclets like the mexican kids in the street isn’t really our style. Not to be sexist, but it does seem like female bloggers tend to be more hesitant to get aggressive with marketing. I’m not really sure why that is. You don’t really have to go all out with aggressive marketing, trying to connect with every blogger out there. You can find a nice medium where you are actively networking without being insincere about it. Great insights Jeremy. I have been to Mexico a few times and I think their strategy comes down to work ethic. They are competing for their lives. They know that if they can get people into their stores, then they can likely barter with them on a purchase. We just wait and hope people will purchase. I am in marketing and know the importance of it. I do think that I need to get more aggressive on my marketing front and hopefully it will pay off. They do definitely have more incentive when they are fighting to feed their families, while most bloggers are just looking to create side income. Maybe the fact that I had no job when I started my blog made me more inclined to be more aggressive from the start. Well that and I was more aware that traffic wouldn’t create itself. Yep it’ll be 1 year of blogging at the end of the month. I can’t say I really have anything planned at this point. Previously I had been planning some kind of giveaway, but I’ve been involved in a lot of those lately. So I might have to think of something else. Or I might just not really do anything for it. The aggressive sales tactics likely is a cultural thing. It’s just like how haggling is more acceptable in other countries. People just have different perspectives on how to do business. 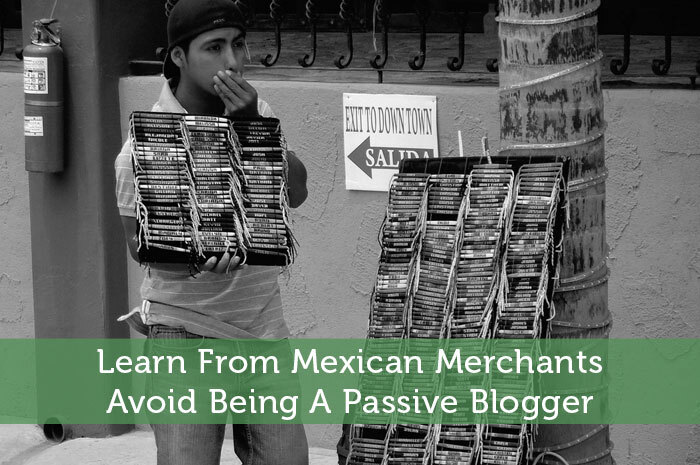 I know what you mean about Mexican merchants – and that’s a great comparison to how we should be about blogging. I took a break from both blogging and commenting for awhile (although not reading – I couldn’t stop doing that). I agree that the best way to get your blog out there is by commenting and social media – Twitter is a great tool to discover other great blogs and help you connect with bloggers. Commenting and social media is a great way to connect with other bloggers and readers, but it is really just the icebreaker. The trick is to use those initial connections and build upon them with further contact. Good to see that you’re back in the blogging game Kyle. Thanks Jacob. Yup, if you want your blog to get noticed, it definitely helps to try to be everywhere. People may overlook you if they just see your blog name once or twice, but if they see you popping everywhere, then they start to take notice. I was totally about to use a curse word. But ABSOLUTELY! Everything needs to be marketed. The thing I want to point out is that placing your store in a crowded area where are there are tons of other stores isn’t the best idea either. If you are in that crowded area you do still need to try to differentiate yourself. So yeah, just exposure isn’t enough. You need some kind of reason to hook readers and to keep the word of mouth advertising going. I love your prospective Jeremy. I use to be more a passive blogger, but I’ve come to realize it’s the more active bloggers who are doing much better. In fact, I’ve been doing a lot more in the way of commenting and promoting others and myself on social media sites. Thanks for the tips. Also I didn’t know that you’ve only been blogging for a year. You are doing very well for just years worth of work. I’d think that most of the successful bloggers were aggressive at some point. They’ve likely backed that approach as they got more established, but they didn’t get to where they are by accident. I wouldn’t even say it’s a year of blogging. In the last several months I have cut back so much by publishing so many guest posts and not doing commenting. It was really an aggressive first 6 months or so that got me to this point. I am pretty terrible at this! I am a pretty passive blogger with the expected results. 🙂 I am going to jot down your suggestions, and make a better attempt at marketing this upcoming year. Feel free to shoot me an e-mail if you need any help with this stuff Vicky. I’ve appreciated your support and I know you’ll do well when you get a little less passive. Great point – getting out and networking was the biggest thing we’ve done for our blog! Yes your blog has come a long ways since before you started networking more. Good to see your blog heading in the right direction. Great analogy. I often have a “if you build it they will come attitude” and find it difficult to continue networking. It pays dividends, though. I look at my next networking opportunity as making a new friend now. That’s definitely an extra side benefit of blog networking – building new friendships. I’ve only met a handful of them in person, but I’m sure I’ll meet most of them at FinCon this year. I actually hate when merchants act like that. If I need your help, I will seek you out. Otherwise, just stay away from me. I don’t like shopping as it is and it’s only made worse when I have to deal with strangers. I admit I was put off by it too, but I had to admire their persistence and effort put into it. I usually prefer to be left alone while shopping, but it seems that when I do want help in a store there is nobody around to help. Insightful post! I feel that marketing my own blog aggressively is a real challenge for me. There’s a balance to marketing aggressively well – the people who do it manage to make you know about their blogs and other projects without being overly pushy. It’s a talent I want to learn! I think that’s my blogging challenge for 2013! I find it’s more about being able to put in the time and work rather than it being a talent. If you want lots of people to know about your blog subtly, you just have to work hard at getting your name everywhere. As your network grows it becomes easier to get the word out as they are much more willing to share your content. I like the comparison. I’m definitely not a pushy person by nature, but I’m experimenting more with marketing as I get more familiar with blogging and how everything works. For now I’m really focusing on trying to make meaningful connections with other bloggers through commenting and guest posting. Being outright pushy might not be too effective either, but it does help a lot to be more proactive with marketing. Guest blogging is one of those strategies that works quite well. If I had more time to write posts I’d be all over that too. I didn’t really know the full extent of blog marketing before getting started either. I figured I would just use the same tactics I had used when marketing ecommerce websites. Early on I realized that wasn’t going to cut it. All of the strong connections does end up helping in so many ways. I network as much as time and energy permits. I do my best to show other sites “mention’ courtesy as well (although they are always blogs I read and enjoy). From there, I have to leave it to chance. I wish I could dedicate more time to it though. Time is a major constraint for most of us. That’s why it’s so important to be efficient with the amount of time we do have. Sometimes there are things you can automate or sometimes you just have to be very selective with who you network with. Great analogy! I started blogging several years ago, but as a full-time student, dad to be, and work, there was little time to focus on blogging. Also, I didn’t have a clue about seo, marketing, social networking, and so forth. I’ve spent this past year doing tons of research and trying to do things right. A major hole in my arsenal is social networking. I recently got on Google plus as well as got a twitter account. G plus is coming along fairly good, I’m pretty active, but twitter isn’t going so well, haven’t really figured it out yet. I know it’s not rocket science, but for someone completely new to twitter its a little p puzzling trying to figure out how to connect with others and gain a following. So, I’m definitely working hard to build relationships but I know it takes some time. Thanks for the tips, great article! Do take the time to figure out twitter since it seems to be the social network of choice for most bloggers. It is great that you have figured out the other stuff already though. Your arsenal should be pretty strong once you get the social networking going. Plus the social networking will help your SEO. Personally I find that I network better via e-mail and more use twitter or commenting to break the ice. No problem. It’s probably nothing new to you based on the topic of your blog. It looks like you share some pretty solid advice. I’ve gone a little more passive in the amount of time that I spend commenting, however I have taken a more aggressive stance with guest posting. I’ve had nearly 8 guest posts this month and it’s another goal I have for February. I think you were due for a period of passivity with the amount of work you were previously putting into your blog. All of that momentum gained is bound to carry things going forward, especially if you’re doing that much guest posting now. It is true that a majority of bloggers won’t add you to their blogroll if they don’t know you very well. The exception would be if you have decent stats and the blogger is willing to swap blogroll links with you. Usually it is better to at least initiate some kind of prior contact beforehand. Make it so that you are not a stranger making such a request. Better yet, help them out first so they feel they owe you something. Great tips. It took me about 2 months to realise what you just posted about. It is weird to think I started out with the mentality that people would just stumble onto my site – how naive! It may be naive, but most people really have no idea how website marketing works. They just assume that by being online you just automatically get traffic. So it’s only natural that many new bloggers would think that way. Very informative post! I haven’t quite decided in terms of how I’d like to further market LDFR! but I know it has good potential once I commit to pushing it out there more. I think you’re doing great so far. I say just keep up what you’re doing and build up your stats. As you keep getting your name out there, you’ll end up gradually expanding your network and find more bloggers to do cross promotions with. There are things you can do to speed up the process, but persistence is invaluable. I love this analogy. Though I haven’t been to Mexico I have been to Cuba and the vendors are the exact same way. Another great post, thanks for the push! I think it is very common in many countries where English is not their primary language. I assume they are just more accustomed to doing business that way. Good luck with your marketing push Catherine. Yep you can’t just sit back and focus exclusively on writing. To get traffic you need to get your blog name out there in front of other people. In time those efforts should result in search engine traffic too. Good luck Jose. I think marketing your blog is a very difficult task, it can make or break you. I have tried to do twitter, commenting, and guest posting to help my blog with getting more exposure. Those are all good strategies to use. Ideally you are using all of those together to attract a varied range of visitors. It can be difficult, but if you keep at it, it can get a steady stream of visitors to your blog everyday. That’s a really good point Jeremy. I’ve got to admit that I did that for the better part of my first month, waiting for people to just come flooding to my site. Like you suggested, it didn’t happen. I guess I still don’t understand how you really drive traffic or maybe I’m just terribly impatient. I absolutely do get some traffic every day from comments (like 4) and I do comment quite a lot (and hopefully they are of value to the conversation at hand). My question is, what can you do that doesn’t cost a ton of money to work towards building traffic to your site? I think SEO wise I’m pretty solid, I guess I just need to get my name out there more? Well we’ve e-mailed back and forth a lot since this comment. It sounds like you’re starting to get a better grasp on marketing now. There are many different approaches you can take. Mostly it comes down to putting in a lot of time and effort to get your name out there and leverage traffic of other sites. Test out some different strategies to see what works best with your particular skill set. Great and well written article. The imagery took me back to this summer when we were on vacation. You are so right, I figure most vendors have a 50% conversion rate if they can get you in their store! These are all great tips, and I’m trying to implement just about all of them. I fully agree with you, marketing is almost as important as content.